Photos courtesy Virginia Tourism Corp.
Tourism remains big business in Virginia. Preliminary estimates released in an August report by the U.S. Travel Association said spending by U.S. residents traveling in Virginia in 2013 rose to $21.5 billion, an increase of 1.4 percent from 2012. This spending directly supported 213,000 jobs in Virginia in 2013, making it the fifth-largest employer in the state, the report said. Tourism jobs, in fact, represent 7 percent of Virginia’s total private employment. These employees earned nearly $4.9 billion in payroll income during 2013, representing a 3.6 percent increase from 2012. Domestic-travel spending also generated more than $2.8 billion in tax revenue during 2013 for federal, state and local governments, an increase of 3.6 percent from 2012. Forty-one of Virginia’s 134 counties and independent cities saw more than $100 million in domestic-travel spending in 2013. The most spending occurred in Arlington County, $2.8 billion, followed by Fairfax County, $2.7 billion, and Loudoun County, $1.5 billion. High-profile historical attractions around the state include Monticello, Colonial Williamsburg, Mount Vernon, Arlington National Cemetery and the State Capitol. Also drawing visitors are theme parks like Kings Dominion and Busch Gardens, and natural attractions such as the Blue Ridge Mountains and Virginia’s lakes and beaches. The following pages offer some insights into various elements of Virginia’s tourism industry, including lists of its largest conference hotels, commercial airports, and largest breweries. One facility expected to join the list of major meeting venues is The Main, a $126 million Hilton hotel and conference center that is currently under construction at the corner of Granby and Main streets in Norfolk. 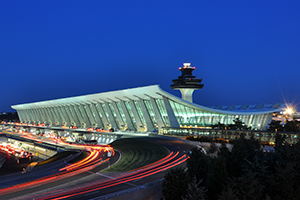 Virginia’s largest airport, Washington Dulles International Airport, saw emplanements decline 2.27 percent in 2013 while passenger volume at Reagan National Airport in Arlington, the second-largest facility, rose nearly 4 percent. The biggest jump in passenger volume, however, occurred at the commonwealth’s smallest airport, Shenandoah Valley Regional, which saw its boardings grow nearly 30 percent in 2013.